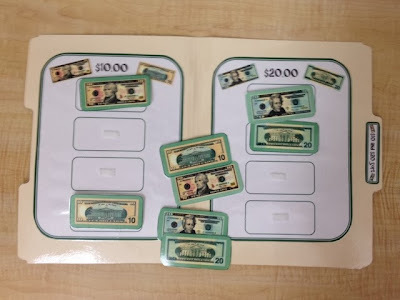 This year my goal for many of my students is for them to be able to recognize the different between different bills. For example, a $20 bill is different than a $1 bill! Even though some of my students can't recognize numbers, I feel like this is something they will be able to grasp, because bills have pictures and even colors to help distinguish them! I created this set of 7 file folders to help reinforce these concepts. 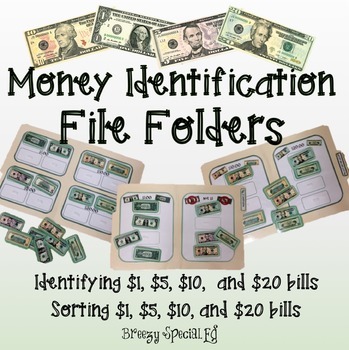 Four of the file folders are simple money identification, for example, sorting $1 bills and not $1 bills. 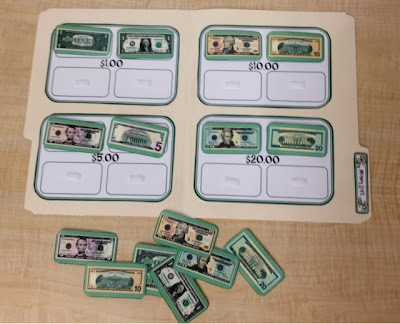 (I am currently using both pictures of the front and the back of bills, but if I notice that confusing any of my students, I will print off more of the pieces and only use the front side of the bills.) Then there are three sorting file folders, sorting $1 and $5, sorting $10 and $20, and then sorting all. I introduced these file folders a week ago, and so far they are going great. I love using file folders to work on skills, because for some reason, my students think they are playing a fun game rather than working. Why? I don't really know, but I'll take it! 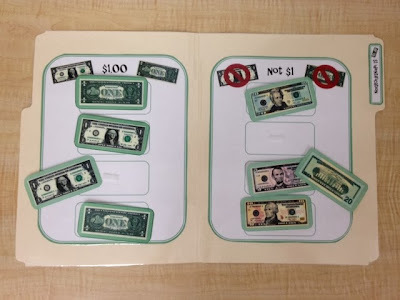 Here is an example of an IEP goal for this concept: Given a variety of bills, the student will identify a) one dollar bill, b) five dollar bill, c) ten dollar bill, and d) twenty dollar bill with 80% accuracy, 4 out of 5 trials. Tabs on the file folders are shaded differently based on the task. Identification file folders are light green and the sorting file folders are a darker green. Here you can see one of the identification file folders. I have added visuals of the bill being identified at the top to assist with sorting between $1 and not $1. 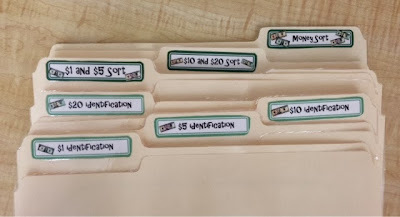 The sorting file folders are similar, but now the student is encouraged to be aware of two different bills in order to sort the two. For the last two money file folders, I have all of the bills in one folder. In the harder level, the student sorts the bills as seen above. 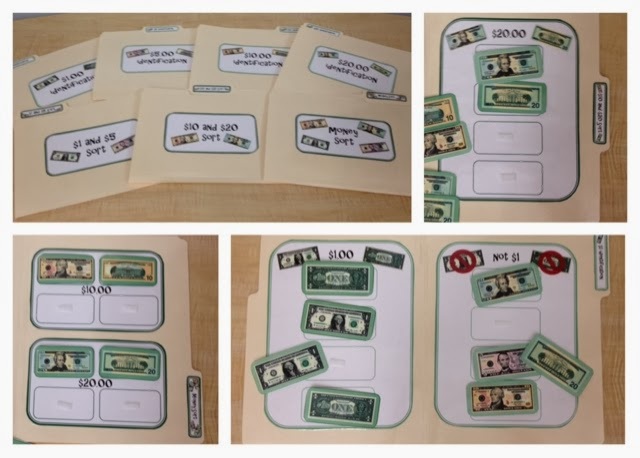 The easier level has the pictures of the bills in each sorting area and student will match each bill on top of them same one. 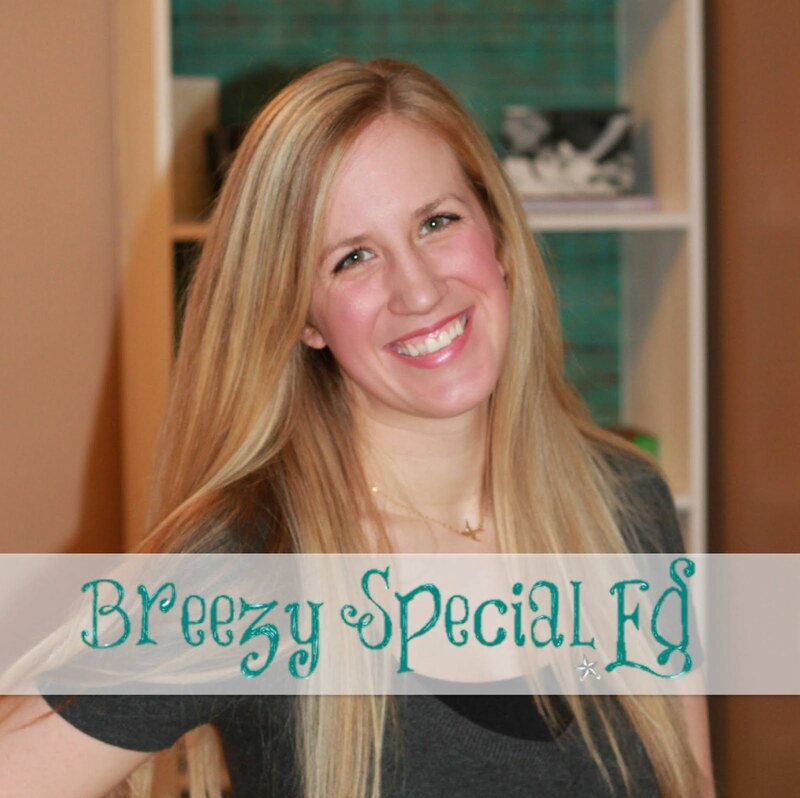 You can get these materials to create your own file folder activities over at my TpT store! I hope they will be as helpful in your classroom as they are in mine. Update: Also available on Etsy, already prepped for you! Check the etsy ones out here!